Crittenton Services, Inc.’s 4TH Annual Founding Father's Cross-Country 5K will take place on Saturday, June 23, 2018 at 9:00 a.m. at Grand Vue Park in Moundsville, West Virginia. The Founding Father's 5K is a unique event, offering a challenging off-road running and walking experience. The 3.1 mile course winds through the rugged hills of Grand Vue's scenic hiking trail. 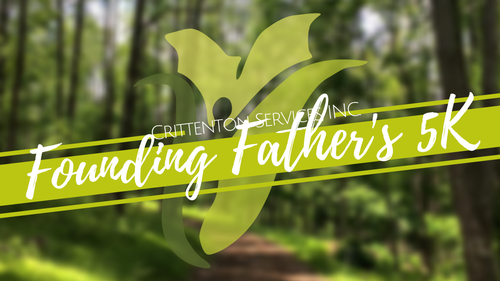 The Founding Father's 5K is a tribute to Crittenton's founding father, Charles Crittenton, and fathers everywhere. Charles founded more than 100 other Crittenton agencies across the country in memory of his daughter Florence. Crittenton Services, Inc. continues Charles’ mission of empowering young at-risk women and families by offering residential treatment, outpatient and in-home behavioral health services, and child care. Crittenton serves more than 1700 young women, children and families in West Virginia each year. This event is a chance for participants to spend the morning with their families, offering a bonding experience like no other, while enjoying the state’s most beautiful trails. Participants will receive a dri-fit t-shirt and a light lunch following the race. All proceeds from the Founding Father’s Trail Run/Walk 5K support the young women, children and families served by Crittenton Services, Inc. Please join us! Registration begins March 1, 2018.